The noisy Holocaust denier and his quieter sidekick appeared to be from a "militia" organization based on a book the noisy one was carrying. There may have been more of them who were less visible but this is unconfirmed. At one point the noisy one muttered about not being able to carry a gun at the protest. The current trends in fascist violence and hate target Jews and Muslims alike, to the point that in European-colonized places threats against mosques have to be treated as threats to synagogues and vice-versa. Both have been subject to hatred and armed attack from the extreme right. 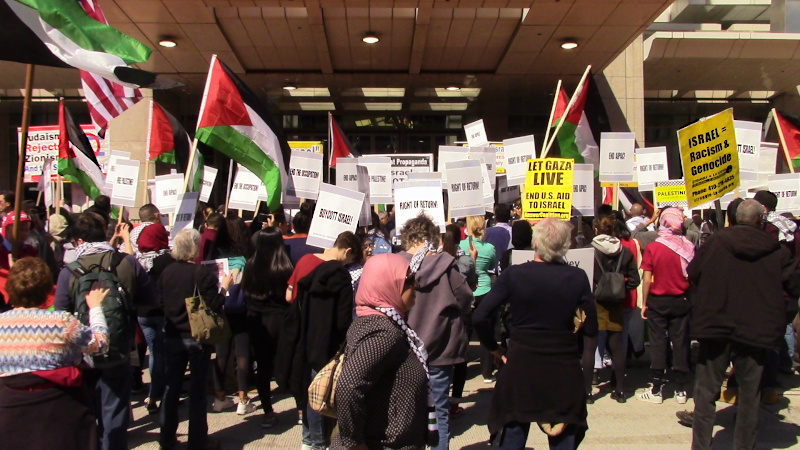 The march was in opposition to Israel's choices to expel Palestinians from their homes and impose a political system of apartheid, and one chant heard on the approach march was "Judaism yes, Zionism no" distinguishing a people and a religion from a political movement and a modern nation-state. Marchers were supporting among other things the Right of Return and Boycott/Divestment/Sanctions, the strategy that defeated apartheid in South Africa without leading to war or population displacement. One marcher held a sign showing a 4 year old child shot and killed by an IDF sniper during the marches on the Apartheid Wall in Gaza. On the other side was AIPAC, the Israeli government's lobbying and influence-buying operation in the US. While many are astounded by this brazen "It's about the Benjamins" operation, AIPAC is unusual mostly in who it answers to. The whole US Congress runs on campaign cash and influence-peddling, which are effectively its "operating system." Corporations ranging from gas frackers and pipeline builders to importers of cheap sweatshop shoes all have their own versions of AIPAC handing out bags of campaign cash and influence. AIPAC is one of the larger lobbies despite not formally named a PAC or "Political Action Committee." They seem to represent Israel's right wing at this time, even welcoming Trump to speak at their 2016 convention three years ago. Given the wave of both anti-Muslim and anti-Semitic hate that Trump has unleashed, that may have been a serious mistake on their part. 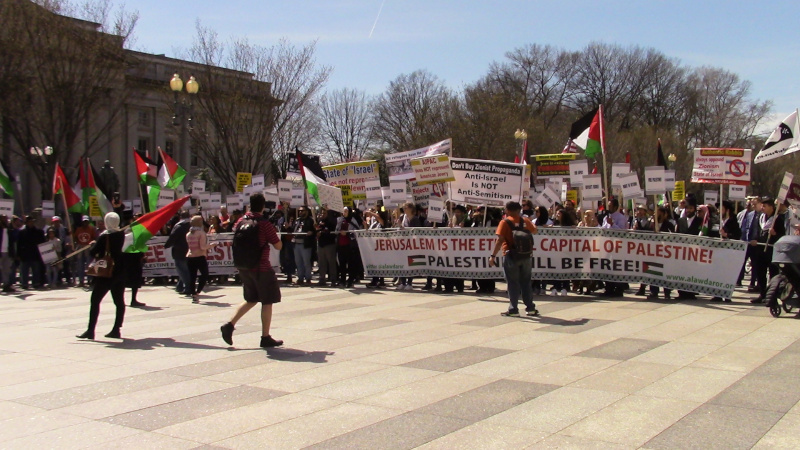 Although the number of Holocaust deniers was very small and they were outnumbered even by AIPAC's own counterprotesters against the much larger pro-Palestine march, the fascists had bullhorns and sought to dominate the 9th and K st corners where pro-Palestine protesters normally engage the AIPAC-goers. While this was going on, AIPAC's security closed the K st entrance to their event, redirecting their participants further up the block. 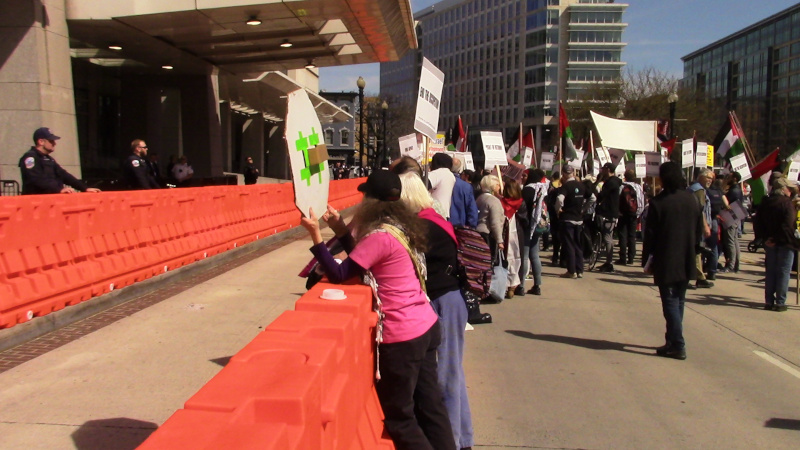 They had a double "aparthed wall" of barricade defending their approach position like they in 2018, but normally AIPAC runs their attendees right past the protesters. Not this year. 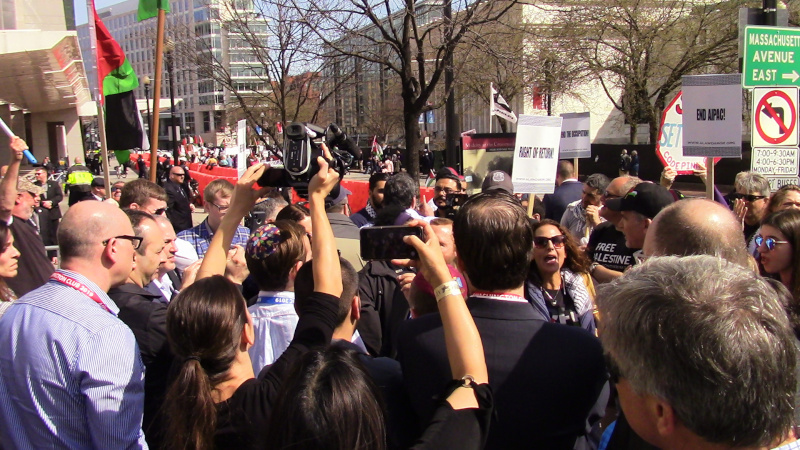 With Holocaust deniers hassling the corner and in the aftermath of recent and repeated right-wing violence against mosques and synagogues alike, AIPAC moved their entrance presumably up to the next block. Still, the venom from the fascists proved this time around to be thunder without rain, and no outright violence erupted nor were any arrests seen. The main Holocaust denier had to be pushed back by cops after calling one of the folks in the JDL's area a "traitor to the US," possibly in an effort to start a fight but he was not arrested. Had he been a Palestinian challenging the JDL that outcome would likely have been different, as the Holocaust denier gets white skin privilige with the cops. 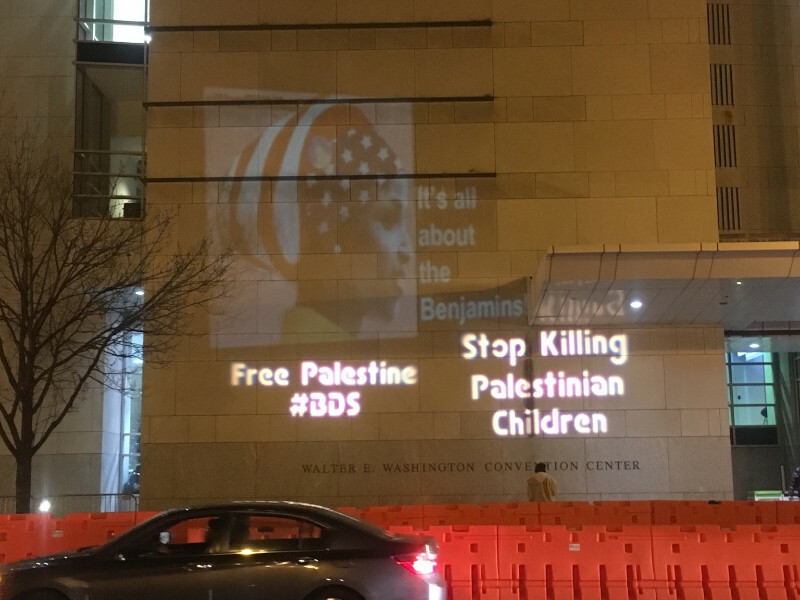 Shortly after sunset, a light projection against AIPAC on the walls of the convention center took place without incident. 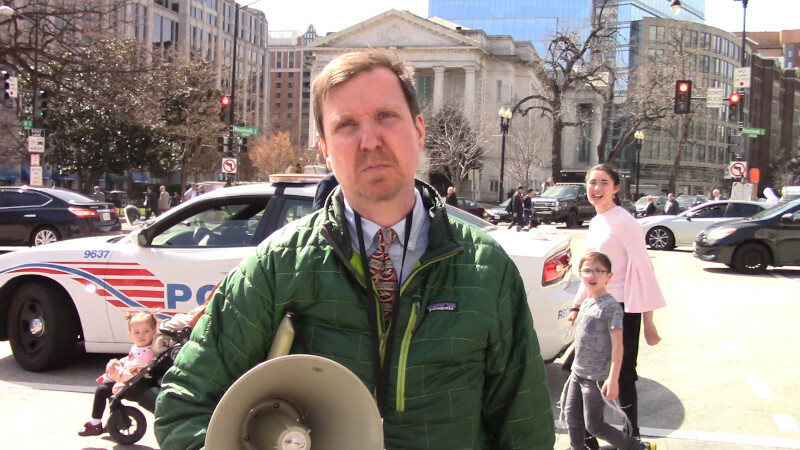 There were concerns that the projector crew would face arrest like the recent incident at the US Capitol or would be assaulted by the JDL(Kahanists) but neither one took place. Perhaps for JDL to assault pro-Palestine protestrs after refusing to take on Holocaust deniers would have been too much hypocrisy even for them? There were actually THREE kinds of fascists present and opposing the pro-Palestine march and two of them presumably opposing AIPAC as well: the Holocaust deniers, a couple of JDL(Kahanist) supporters, and even Westboro Baptist showed up. The noisiest Holocaust denier wore a press badge identifying him as Chris Dorsey, no idea if thats his real name or not. When the Holocaust deniers were pointed out to the Kahane supporters, the JDL folks did absolutely nothing in response to their presence. This is in contrast to their actions both last year and especially in 2017, where activists supporting Palestinian marchers were assaulted by Kahanists. Even more oddly, some US neo-Nazis have cited both the JDL and Israeli far-right on one hand and ISIS/Taliban/al-Quada on the other as "identitarian" movements to be emulated by the US and European alt-right. The October 2018 Pittsburgh Synagogue attack and March 2019 Christchurch, NZ mosque attacks suggest that there is more than just talk behind the far-right's emulation of previous terrorist movements.